Pedicure file with double-sided coarse file for extended routine usage. Silver - Pad Print - Six piece manicure set in aluminum case. This unique white emery board can be used by people of all aged groups regardless of being young or old. You can imprint your company logo on it and appeal to the wide range of consumers and customers .With this product your advertising potential is limitless. Imprint Area Size: 4" x 5/16"
Product Name: Foamcor salon board. Available in an exiting two colors that can add to the brightness of the manicure kit.great way to promote hair salons,insurance companies and political candidates. 2 color imprint - Foamcor salon board, 3 1/4' X 5/8". 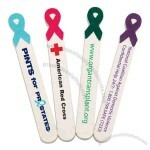 Emery boards are a great way to promote political candidates, hair salons, insurance companies and banks. 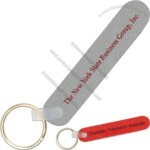 Size: 3 1/4" x 5/8"
Product Name: Custom double sided 3 1/2" emery board. 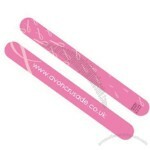 This is high quality extra effective cushioned nail file. The picture on the nail file will not wear off for a long period of time. 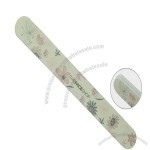 Product Name: Emery boards are popular to women, can imprint any full color imprint. An emery board which is very popular among kids and women due to the unique shape and pink color. Lasts for a long time without any problem and is available with full color imprint on the surface. 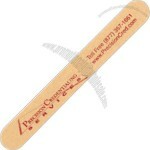 Size: 7" x 3/4" x 20/127"
Product Name: Foam core salon style cushion emery board, nail file, 3.5". 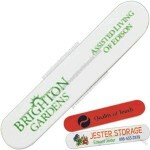 This emery board nail file is 3.5” long which provides the perfect care for people with large fingers. A simple and unique promotional tool that can be used by upcoming brands of hair salons to make an impression on the customer and client. Product Name: Salon board with professional quality foam insert for maximum comfort. Professional quality foam provides you with maximum comfort and care. Available with one color imprint on the surface. Size: 6.50" x .75" x .13"
A great promotional tool that can be used as a marketing campaign for political leaders and new hair salons. Product Name: Economy for him or her manicure kits have emery boards. 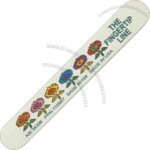 Classic style emery board that can be kept in the manicure kit while going for an outing or picnic. 2 Emery Boards. - Economy manicure kits for him or her. Includes 2 emery boards, 4 5/8". 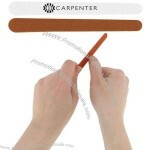 Size: 1" x 5 9/16"
Product Name: Awareness Emery Board Nail File. A unique awareness emery board nail file with rough edges and leaves you with a comfortable feeling after the use of the product. 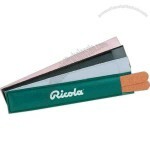 Product Name: Foam core salon style emery board, nail file that is foot shaped. Foam core salon style emery board that is Foot shaped nail file. This foot shaped emery board can be an attraction in the next trade show.3.5" foam core salon style custom emery board and nail file. Popular and economical pastel-colored assortment of emery boards, 4 7/8" x 1/2". An assortment of three background pastel-colored emery boards, 4 7/8" x 1/2". Orders are printed with approximately the same quantity of each color. Made in USA. 2 color imprint - Salon-sized emery board, 4 7/8" x 11/16". 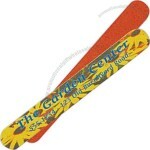 2 color imprint - Salon-sized emery board, 4 7/8" x 11/16". Standard sandpaper on both sides for a smoother grit than our professional boards. Size: 4 7/8" x 11/16"
Foamcor Salon - 1 color imprint - Foamcor salon board, 6 1/2" x 3/4". 1 color imprint - Foamcor salon board, 6 1/2" x 3/4". 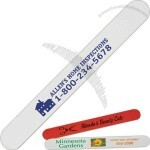 Emery boards are a great way to promote political candidates, hair salons, insurance companies, and banks. 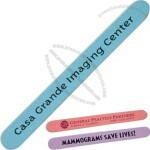 1 color imprint - Salon-sized emery board, 6 1/2" x 3/4"
1 color imprint - Salon-sized emery board, 6 1/2" x 3/4". Standard sandpaper on both sides for a smoother grit than our professional boards. Emery boards are for multiple functionalities. They can be used for nail filings, foot filing and to soften rough surfaces. Promotional emery boards reflect the saloon style nail filing and foot soften effect with perfect shape of the nails to let you go into the outside world with elegance. They are suitable for all age groups and are the must for your manicure kit. They are available in various colors, shapes, sizes, designs and prints. 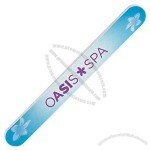 Promotional emery boards are so designed to precision of cuts keeping in mind the beautiful nails of beautiful women. They even have quality foam material inside to provide the maximum comfort. Custom-made Emery Board From China Factory, Low price Emery Board, Top Quality, True wholesale source for original!